We are bright enough here at Propella to know that if you are reading this you have discovered our new Web Site. Ever thought of turning on a light in an electrician's house? Quite wise! He's too busy looking after business to bother about his own pad. Propella was a little like that - a high-tech IT company with a sparky's approach when it came to our own Web-Site. But... we saw the light (unlike our sparky friend) and enlisted FunctionEight Limited to bring us up to scratch. The result is a fresh approach to news and product presentation which blows the rest out of the water as we are so modest to often proclaim. Congratulations to FunctionEight for delivering on time and on budget. Our next release will offer a login section for customers to download their project statuses, see User Group announcements and receive new release information. Living the Propella mantra of 'all work and no play does not a Propella Head make' we seconded FunctionEight principal Martin Abert to come off the bench for the Propella business house golf team while working with us. 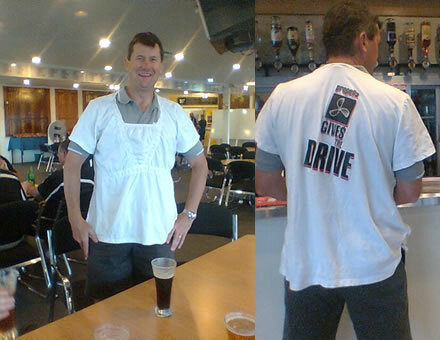 Sadly Martin's stated golfing prowess was a little over-stated and an almost unanimous vote saw him obliged to wear the Propella Big Girls Blouse at the after match function.